What can I say about this man? 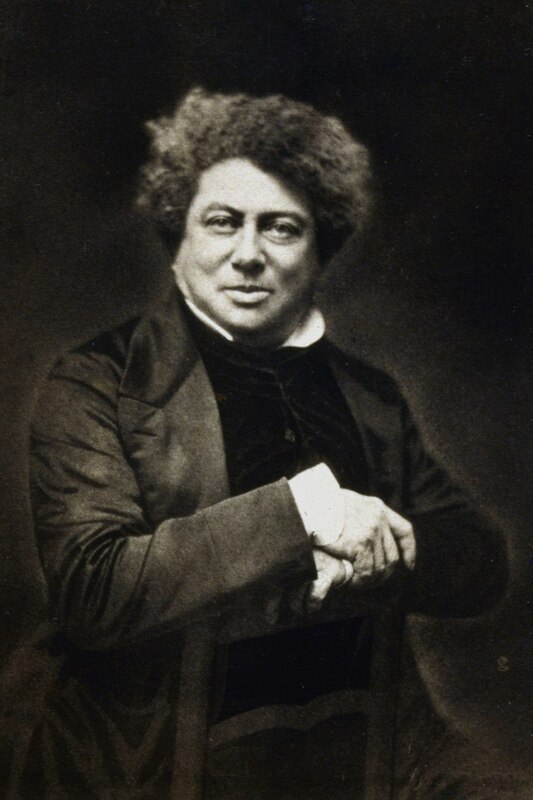 The grandson of an African slave from modern-day Haiti, a drug addict, and a man-whore, Alexander Dumas wrote a number of novels, stories, dramas, and non-fiction. And when I say man-whore, I’m not kidding. Scholars have confirmed the existence of at least 40 mistresses for this guy. It’s amazing he got any work done. On that note, apparently he didn’t do it all by himself. It turns out Dumas was a bit of a plagiarist, taking credit for work resulting from various collaborations with other writers. Auguste Maquet, for example, wrote plots and initial ideas for some of Dumas’ more memorable novels. Have you ever heard of Maquet? I sure haven’t. You can thank Dumas for that. Bottom line: don’t work for Alexander Dumas. If he can screw you, he will. As for the drug addiction, Dumas was a firm believer in the social consumption of marijuana and opiates. His novels reflect this—at least the ones I’ve tried reading do. Every time I try to start one, it goes all acid-trippy, and I get bored trying to figure out the story. For one thing, the plots are all over the place. I really don’t know how The Three Musketeers got so popular…it almost takes a historian to even discover the various plot points, much less decipher their meaning. Having said all this, I must admit that The Count of Monte Cristo is rather brilliant. There are only two drug-related scenes throughout, and it’s fairly coherent otherwise. I’m quite proud of Dumas for this one (although this is one of the projects he worked on with Auguste Maquet, so who knows how much of a contribution Dumas even made). The Count also so happens to be my mother’s favorite book, which can only mean one thing. Throughout my entire life, I’ve had to hear rants about Hollywood’s mess-ups of the original storyline. Whoopee. One of my Mom’s biggest complaints, and I have to admit that there is some merit to this, involves Edmond Dantes’ “enduring” love of Mercedes. In every freaking movie, miniseries, and play, he ends up with Mercedes, his former love. In the book, Dantes actually falls for his ward Haydee at the end. And you know what? I adore Haydee. Mercedes is dramatic, unfaithful, and really slow on the uptake, whereas the young Haydee is smart, blunt, and desperately loyal. After all the crap that Dantes went through in prison, he needs someone like Haydee. Yet, she’s always written straight out of the story. I fully realize that I went somewhere a bit off topic there, but I didn’t actually want to rant just over The Count of Monte Cristo. It was good, don’t get me wrong, but I read it a good decade ago. I didn’t really want to read it again. Have you seen how long it is? Since my mother insists that “only the unabridged version will do,” I’d have to reread over a thousand pages. Not today, thank you. The Count of Monte Cristo=good story in need of a better screenwriter. Auguste Maquet=…what did he do again?